Updated 1/3/2014: We are proud to announce that we are Diamond Level 5 with Karisma Hotels which is their highest production level! I wanted to announce that Wright Travel Agency is a GI Wedding Consultant! Use a Wright Travel Agency to book your Destination Wedding for perks and expertise that matter! 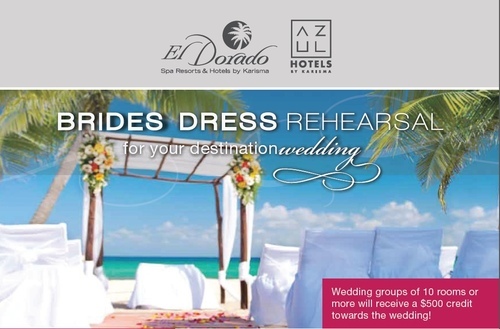 Let Wright Travel Agency book your wedding and you can go on Karisma Hotels Brides' Dress Rehearsal! For only $399 per couple, brides and their grooms can stay for 3 nights at their hotel of choice and have the opportunity to taste different cake options, sample menu items and even view the various locations and setups for their ceremony and private events! And more! (click link for more information). This is in addition to other incentives we may negotiate for you, like free room with so many rooms booked, etc. Because a destination wedding should be fun, not stressful, leave your event in the hands of our GI Wedding Consultant, who have gone through extensive destination wedding training, and are equipped with all the resources you need to make your special day seamless. * The promotions above can be cancelled by the resort or agency at any time without warning. Oh that's so nice!! Wish there was a deal like that the AMRESORTS! or you can give to someone else in the group that books through Wright Travel. We only have a limited amount of certificates so this is a limited time offer while certificates last so contact us to get your upgrade! To get more information about booking your Karisma Wedding with a GI Wedding Consultant at Wright Travel Agency, you can contact us here: GI Wedding Consultant Information Request or email us! Gourmet InclusiveÂ® Vacations Include: All meals, drinks, activities and more! With more than a mile of sandy beach in Mexicoâ€™s Riviera Maya, El Dorado Royale, a Spa Resort, by Karisma offers an escape which no other destination can match. All the luxuries you can dream of, including 8 gourmet a la carte restaurants, two spas, 13 pools, swim up bars, spacious suites, and more, are found here. Travelers join us from around the world for romantic outdoor beach weddings or ceremonies in our intimate beachfront chapel,relaxing honeymoons, anniversary celebrations, or just much needed time off. Azul Beach Hotel is a family-friendly, boutique-style propertylocated on a gorgeous beach 20 minutes from Cancun International Airport. This hotel especially caters to families with young children with loaner baby equipment, kidâ€™s club and parent support. The exclusive Family & Friends Vacation Planner coordinates family reunions. Romantic couples love Beachfront Sky Massages and Suite Scenes. The newly renovated resort has brand new premium suites, more restaurant options, a new Azulitos Kids club with Fisher-PriceÂ® toys and My Gym equipment to accommodate the little ones. Azul Fives is an oasis known for catering to groups of family,friends, and couples. Deluxe rooms; two and three bedroom suites and Penthouse suites accommodate any group size. Our full-service concierge can recommend a long list of activities from off-site tours to Mayan ruins to on-site cookouts. Azul Fives caters to kids. With our Azulitos Kids club with Fisher-PriceÂ® toys and MyGym equipment to accommodate the little ones. Azul Fives is the perfect vacation oasis for anyone! Hot Deals $250 Air Credit: Valid on new bookings made 8/13 â€“ 9/2/12 for travel through 12/22/12. Minimum 5-night hotel accommodation at a participating Hot Deals hotel and roundtrip airfare required. Credit is per booking and awarded at the time of booking. Not responsible for errors or omissions. If you are getting married at a Karisma Hotel or thinking about getting married at a Karisma Hotel, join our Karisma wedding webinar, October 6 @ 6:00pm PST. Registration information has been added to the original post. Space is limited! We were invited to the Karisma GIVC awards event that is happening right now. Just in from TA Wendy at the Karisma Hotels GIVC Awards Event. Wright Travel just won the award for Best New GIVC in the Western US! Plaque in on the way! We also won a top Destination Wedding GI Award! We are so excited to have our hard work acknowledged! Well we have returned from the Karisma GIVC Awards event and came home with 3 awards. Kudos to our team for their hard work and thank you BDW brides for allowing us to participate in your special day! The BDW Team is going to be visiting the Karisma Hotels next week. Let us know if we can check anything out for you! We were just at Azul Beach for a site inspection and I was able to take some pics. I will post more as I get them. Remember, we are Karisma GI Specialists so book your wedding with us and get extras free! Just a heads up that the upgrade's have been updated.